This British born duet were real brothers who are nowadays sometimes referred to as a kind of UK edition of the Everly Brothers. However, despite the fact that their recorded output largely consisted of covers of American recordings- including 'When Will I Be Loved'- there really wasn't much similarity with Don and Phil. Like so many youngsters of their generation, they had started performing as members of a skiffle group, and from this it became apparent that they sang well together. In fact their first recordings show evidence of this early influence although their first chart showing was straight 'pop'. They were probably fortunate that after the demise of the Top Rank label they moved to Pye where their production gained the magical benefit of Tony Hatch. The EP shown on the right appears to be the last that Pye issued for Ricky and Geoff. For some reason every picture of the pair seems to have them in a similar pose to this one. Their first chart success was followed by more songs, all sung in a somewhat similar upbeat style. Despite their reputation for producing cover versions, some of their 'B' sides were written by themselves. Sadly, the formula didn't last because their chart entries became intermittent and gained progessively lower positions. By the time that it became evident that 'beat' groups were the fashion, Geoff and Ricky were no longer making the chart at all. 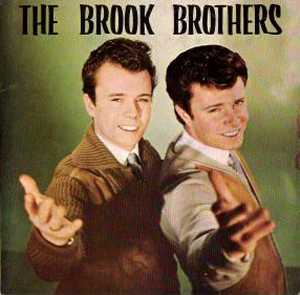 Despite changing their name to the more contemporary sounding 'The Brooks', they never had any further success with singles.